Regarded as one of the most popular and knowledgeable television commentators today, former England player and coach David 'Bumble' Lloyd has graced television screens since 1999. Since that time, he has covered many series involving touring Pakistan Test sides with great interest and in an exclusive interview with PakPassion.net, spoke about his impressions of Sarfaraz Ahmed's inexperienced Test side during the recently concluded Test tour of Ireland and England, Shadab Khan's future as a top-quality all-rounder, why Mickey Arthur is doing an excellent job as Head Coach for Pakistan, his willingness to travel to Pakistan in future and his memories of some of the Pakistan greats such as Javed Miandad and Inzamam-ul-Haq. PakPassion.net: What are your thoughts on the current Pakistan Test side? David Lloyd: I thought that they played really good cricket at Lord's. They have an inexperienced bowling attack which is well lead by Mohammad Amir. Apart from Mohammad Amir who can bowl with pace and has that left-arm variation, they have Mohammad Abbas who bowls wicket to wicket like Vernon Philander and Bhuvneshwar Kumar and makes the batsmen play whilst aiming for top of the off stump. If there is any sort of movement available on the pitch, then he looks to me to be a bowler who will find it and take advantage of that particular type of situation. In Shadab Khan, they have a young leg-spinner who gives the attack some more variation. I am a massive believer in leg-spin and feel that if you have a good leg-spinner in the team, and as the Test match progresses, he will get more and more into the game. He might not be in the game in the first innings but if you get runs on the board whilst batting in the first innings then he’s right in the game. It's a young team, with lots to learn, but with a bright future. PakPassion.net: Any other Pakistan players who have impressed you this time around? David Lloyd: At the Lord’s game, Michael Atherton was really impressed with Asad Shafiq and said that this bloke can bat, and I agree with him and think that he is a nice and compact player. PakPassion.net: What are your views on Shadab Khan who seems to have settled so well into international cricket? David Lloyd: Well he is there in the squad in place of Yasir Shah who is a fabulous bowler and one who is not fit for this tour. So, this lad comes in - he is 19 years old now, but I would love to see what he has achieved in 10 years’ time. He can obviously bat as we have seen so far given that he has 3 Test fifties in three matches. So, I think in the future he will make himself into an established number 6 batsman and his bowling will also improve as he will pick up all the tricks and tools of the trade. He bowls with a decent pace and he’s got a leg-spinner which he spins well, but he needs to work on his googly and a flipper. Once he has all that and he understands leg-spin then he will be in his prime as a leg-spinner by the time he is 28-29 years old. PakPassion.net: Pakistan's performance at Lord’s must have impressed you immensely? David Lloyd: I feel that Pakistan have a good varied attack and at Lord’s, they jumped on a situation where England were all out for 184 and you just have to bat past them. The dressing room chat would have been that if we can bat once, we can beat England by an innings, so a good disciplined effort was needed. Whilst they did not win by an innings, the fact is that Pakistan got their rewards at Lord’s. PakPassion.net: Why do you think Pakistan struggled at Headingley? David Lloyd: Coming to Headingley on Day 1, on a good batting pitch and on a day which was excellent for batting, they definitely made the right decision to bat first. But, England bowled really well. 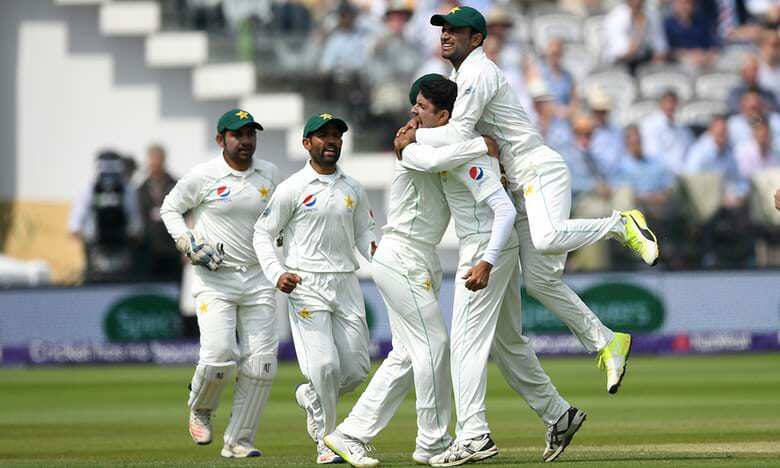 It was a very still day and you don’t get that very often and on top of that it was sultry and humid, and England got the ball moving around, particularly in the air and that meant Pakistan's batsmen could not repeat their performance of Lord’s. PakPassion.net: Do you think Mickey Arthur is doing a good job as Pakistan Head Coach? David Lloyd: I think the Pakistan side are very well lead. At the management level, the Head Coach Mickey Arthur has a lot of integrity and he understands that these are players and not machines as they can have good and bad days. What you need to instil into the leaders of the team is that you will have more good than bad days. PakPassion.net: It must be a tough task for the youngsters in the team to live up to the standards of some of the greats who have played for Pakistan? David Lloyd: Any young team that represents Pakistan has a lot to live up to because of what’s gone on in the past where you have had some fabulous players. There have been some great fast-bowlers and spinners and there have been some great leaders, batsmen and all-rounders from Pakistan too. The quest for any young side particularly in Asia is to emulate those great players in a career lasting 10-12 years. There are examples of some great players like Younis Khan who is one of the best I have ever seen, a fabulous player like Inzamam-ul-Haq and then you have the two big lads, Wasim Akram and Waqar Younis. I have watched some old recordings of matches played previously by Waqar where he is bowling at a serious 90 mph with rapid in-swing to boot. Then we have Wasim Akram shaking everybody up; he certainly was a colossus of a man. So, they have produced great players and some great examples for youngsters to look up to and use as role models. PakPassion.net: Do you feel that the role of coaches is a little over-rated? David Lloyd: Let me tell you this. I have been working at the IPL and I have been told by a couple of coaches in India that there are a lot of good young Indian players coming through and when I asked them why that was, they replied that it was due to a lack of coaching; due to the number of cricketers, there aren’t enough coaches, so the players work it out themselves. And I feel it must be the same in Pakistan with young players coaching themselves by watching Younis Khan, Waqar Younis and Mohammad Amir, Saqlain Mushtaq and Shadab Khan - they just mimic those players and get on with it. I thought that was a good point and something to ponder upon as in places like England we seem to put in a lot of emphasis on coaching. PakPassion.net: Captaining Pakistan is a tough ask as is, but do you envy Sarfaraz Ahmed’s position as captain in all three formats? David Lloyd: No, I don’t envy that at all. As is, being a wicket-keeper is such a tough job where you have to be down and up all day, every day. I always think that a wicket-keeper will make a good vice-captain. He is in line with the bowler and tells you which bowler is bowling well and who is on song at that moment and so on. But to make all those decisions themselves as a captain is tough and this is why I am not a great fan of wicket-keepers as captains as I feel that there is too much for him to think about during the day’s play. PakPassion.net: Do you think the absence of experienced players in the Pakistan squad make them a more cohesive unit? David Lloyd: As a coach, if you have a young team under you, there really is no problem as there are no blokes in the team saying, “I’ve been here before” or “I’ve seen that coach come” or “I’ve seen that coach go and now we have another one” and so on. With a young team, you will have a side that will settle down and listen to the coaches. Mickey Arthur, the Head Coach and his bowling coach, Azhar Mahmood along with Grant Flower and other staff will have a young team who will listen to whatever they are told to do. What they won’t do, however, is give consistent performances and at times you will find yourself taking one step forward and two steps backwards. You will also get those moments when the TV cameras pan to the balcony and you have pictures of the Coach holding his head in his hands, closing his eyes and shaking his head and reacting to a mistake by his players. But, that consistency will come eventually with the amount of cricket the team plays. PakPassion.net: How difficult is it to coach a team like Pakistan and would you be interested in getting involved with Pakistan cricket in future? David Lloyd: It would be an intrigue and I know Mickey Arthur has said that it’s the most exhilarating job that he’s had. Because when you are out there in Asia, you will come to understand that the fans are fanatical about support of their team. Cricket is everything, whilst in England, cricket isn’t everything. Here, whilst the game is nice, it’s really football which rules the roost and then there’s a lot of rugby, cycling and other sports - cricket just fits in somewhere in there. When you are in Asia, your mind boggles as everyone is into cricket and all the talk is about the game, regardless of whether you are male or female. Having said that, what I have been chatting to about Wasim Akram is that if there is an opportunity for a commentary stint in the Pakistan Super League (PSL), I will have a go. I told him, I don’t mind going to Pakistan. I'd love to go back to Pakistan to places like Karachi, Lahore and Islamabad and I am fine with that and not bothered about it as it’s a great spectacle. PakPassion.net: You have obviously been to Pakistan before, what are your memories of the type of cricket played in that part of the world? David Lloyd: I have been on tour to Pakistan years ago and we had a great time, it was fantastic and a lot of fun, and the people were lovely as well. The cricket out there was invigorating and different. I always feel that when you play cricket in Pakistan, you can almost compartmentalise the game so basically the quick bowlers get the brand-new ball and when the ball is older, it gets some reverse swing. Later on, as the pitch gets dry it will take spin and in with all that there is some great batting to be done. There are passages of play that are totally different in nature and it’s not like the UK where it's so overcast and the quickies will rule the roost and you might see some spin here or there. You can almost write down what will happen next when playing in the Pakistan, but you cannot do that in England. PakPassion.net: How tough is it for one team to dominate all three formats of the game? David Lloyd: It is difficult to always give it your all in the three formats of the game. The Champions Trophy was a fabulous win for Pakistan but Twenty20 is luck of the draw. You can be one kingpin outfit one year and the next year you are struggling to win. To me, cricket is a long horse race. It's like the Grand National which is gruelling in nature. You have a long time to prepare and produce your best so to be able to stay on top of the pile is a tough job. If you look at England in Tests, you will see that we are number five in the ICC rankings which is about right based on what we are seeing from them. If you move to One-Day cricket, we have a real outfit under Eoin Morgan but in T20Is, we have been poor as the personnel are changing all the time. PakPassion.net: What do you make of Mohammad Amir since his comeback? David Lloyd: He is undoubtedly a quality bowler but with three other bowlers in the team, he needs to be given a rest as well. Let me explain in football terms, where the manager benches his player without any reason apart from the fact that he just wants him to be fresh for the next game. This is what we are also learning to do in cricket as well. Your real workhorses are your fast-bowlers. I say that without any disrespect to the batsmen who are basically there to just bat, but the real hard work is only in fast-bowling. When it comes to the bowler, the physio has to make a judgement as to the bowler’s fitness and decide that if he is at the brink of an injury, then he needs to be pulled out of the squad and rested. The fast-bowler is like a race-horse and would like to play every game. However, it’s the management who decide, in the interest of getting the best performance from the player, that if they need him for a particular game in the future then they need to pull him out now so that he comes back fresh later as he can win them that important game. PakPassion.net: Pakistan cricket has produced some great characters in the past, are there any favourites that you have? David Lloyd: On rain-days like we recently had in the Leeds' Test, we have this habit of picking our World XIs when we have time on the side and I always go back to Javed Miandad who was a handful and an absolute rascal but what a brilliant player. Then it's this lad, who recently retired, Younis Khan who was excellent, as was Inzamam-ul-Haq, who I thought was a hoot and such a brilliant character. I will never forget the time we were out in Pakistan and this was before a Test match and the trainer had Pakistan players running up and down in the heat and doing some stretches while Inzamam was calmly sitting on a chair with his pads on, waiting for someone to bowl to him in the nets. PakPassion.net: You must be missing your good friend Misbah-ul-Haq? David Lloyd: Misbah was a great leader. He looked to me as a well-educated and clever man who looked after his players and the players played for him. He was like a father figure to them and I know that he isn’t in the Pakistan Test squad now and I do miss him.